An 89th minute winner ensured Carlton Town the win as Ilkeston were left disappointed in a battling pre-season clash. Ilkeston started proceedings with Liam Hearn and Anthony Dwyer up front, Luis Rose and Haydn Goddard on the flanks. Danny Gordon and Mark Shelton sat in midfield. The opening stages of the game were cagey with both the hosts and Ilkeston trying to find space within the midfield in order to link up play. Carlton were marshalling Liam Hearn well and both sides struggled to generate openings; Rose delivered a cross which was too long and sailed out. Ilkeston should have led after half an hour, Rose was put through in a one v one situation but a wonderful save from Steggles tipped the ball around the post. From the resulting corner Luke Foster hit a header off the bar. However with 41 minutes gone, the Robins did lead. A great cross into the box from Dwyer found Captain Matt Baker who headed in unmarked. Hearn had a chance to make it two but his point blank header was saved. The second half saw a wriggle round of changes and often a dis-jointed period of play as expected in pre-season. Ilkeston started well, David Jones headed wide from a Rose cross before Shelton sizzled a strike just over the bar. But five minutes into the second half, the hosts equalised. A gorgeous outside of the foot cross from Kevin Lesamba found Josh Rae who volleyed home with a great finish. Ilkeston looked for a winner and Goddard nearly found it, sliding an effort wide of the far post from Shelton’s cross. Carlton then stole the win late on after an in-swinging free kick wasn’t dealt with by Ilkeston; Kyle Stovell found room and drove an effort past Jamie Hannis to the delight of the home support. But it was a healthy and positive outing for Ilkeston as their pre-season schedule continues to roll along. 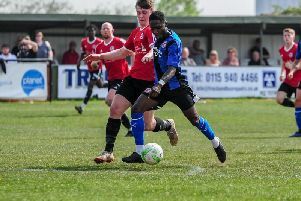 Next up, Ilkeston travel to Heanor Town tomorrow evening, 7.30pm kick off, if you can’t make it to that fixture, and Ilkeston XI take on Aston United at the NMG, 7.15pm kick off, entry is free. Saturday’s fixture sees Chesterfield visit the NMG, 3pm kick off. Ilkeston FC Starting XI: Ross Durrant (Jamie Hannis 57), Jak Kenworthy (Connor Walters 75), Rory Coleman (Jaylon Bather 57), Mark Shelton, Matt Baker(c), Luke Foster (Max Thornberry 75), Luis Rose, Danny Gordon (Keenan Meakin 81), Liam Hearn (David Jones 45), Anthony Dwyer (Ben Morris 57), Haydn Goddard. Carlton Town Starting XI: Jack Steggles, Lawrence Gorman, Daniel Fletcher (Niall Davie 30) (Antonio Wedderburn 82), Kallum Keane, Romanie Graham(c), Kieran Walker, Eddie Schoenecker (Raheem Williams 65), Julian Topliss, Kevin Lusamba (Matt Newton 58), Josh Rae, Jake Wholey (Damon Charton 52).